Welcome to the Deer Class. The Class Teacher is Miss Lineker and the Teaching Assistants are Mrs Pepperdine and Miss Sampson. We are lucky to have Mrs Maw and Miss Roberts for some afternoons too! Welcome to Term 4 in the Deer Class! This term, we shall be learning about Natural Disasters. DT designing shelters to protect us from a natural disaster! What impact are we having on the Earth? We have had some fantastic, insightful discussions this week about climate change. Did you know that the planet's average surface temperature has risen about 1.62 degrees since the late 19th century, a change driven largely by increased carbon dioxide and other human-made emissions into the atmosphere? We have been exploring the difference between climate change and the weather and have learnt that the weather changes daily, but climate change happens over a long period of time. However, this brought up lots more questions from the children about our environment, so we decided to investigate the temperature and rainfall over the course of one week and see if we can spot any patterns. Here we are setting up our thermometers and rain measuring devices! I wonder what the results will show? World Book Day fun in Deer Class! We loved World Book Day this year! Not only did we have the opportunity to dress up as our favourite book characters, but we also got to listen to some of our favourite stories being read by different members of staff! We spent time sharing stories with Year 3 and in our writing session in the afternoon, we explored a new story called 'The Arrival' by Shaun Tan. Our curious minds tried to tell the story as this particular book does not have any words! To top off the week, Miss Anstey announced that we had raised lots of money for new books during our school sponsored read. We cannot wait to decide on what to buy for our class! We had an amazing time during STEM week in Year 6. We learnt to use saws safely to cut the wooden frame and we accurately cut triangular gussets to attach the frame - this blew our minds! Excellent engineering and team work skills were seen throughout the week by the Deer Class. We cannot wait to finalise our car designs and get started on the outer shell! What have the Deer Class been up to in their first week back? This week started with a practice air raid siren, just like the one used in WW2! We took cover underneath our tables until the 'all clear' was given! In English this week we have been listening to Neville Chamberlain's speech declaring the outbreak of war on September 3rd 1939. We have learnt from the Prime Minister how to deliver a powerful speech, what the features of a good speech are and then used these to write our own. On Friday we also rehearsed them outside and we are looking forward to adding our audio to a special app which will make it look like we are Mr Chamberlain speaking to our country! An exciting visit from the Library Bus for Y6! Thanks to Miss Anstey for organising for the local library bus to come and visit Wyberton! The Deer Class loved climbing aboard and selecting a book to borrow on our class library card. We love reading in Year 6! Christmas in the Deer Class! We have thoroughly enjoyed the last few weeks of term in the Deer Class! and finally selling our products at the fair! An educational day at Duxford Imperial War Museum! The Deer Class were so lucky to be given the opportunity to visit IWM Duxford - it was an awesome day! We saw so many exhibitions and memorabilia from WW1 and WW2. We even got the chance to walk through the inside of a concorde! We were so greatful to the volunteers at IWM Duxford who spoke to us throughout the day and told us stories of how the aircraft came to the museum and they answered our thousands of questions! By the end of the day we had walked miles and learnt so much, but we could have easily spent another day there! We must say a huge thank you to our parent helpers - without them the trip would not have been possible. To mark the 100th anniversary since the end of WW1, the children of Wyberton each made a poppy as a symbol of Remembrance. Look at the outstanding display in our school hall that has been put together by Mrs Dodes. Well done to all involved - I am sure you will agree that it is an incredible sight to be seen. This term we are going to be learning about the First World War. Using a cross-curricular approach, the children shall be learning about the meaning of the poppy for Remembrance Day, how the war started, the life of a soldier, the fascinating and harrowing story of life in the trenches as well as understanding the war effort at home. This will include making our own Christmas rationing packs, making our own 'shoebox' trench, writing letters home from the front line, designing torches and investigating light and electricity in Science and ending with a trip to the Imperial War Museum in Duxford! Wow! I hope you are ready for an exciting term Year 6! Keep checking back on our page to read updates about our learning. 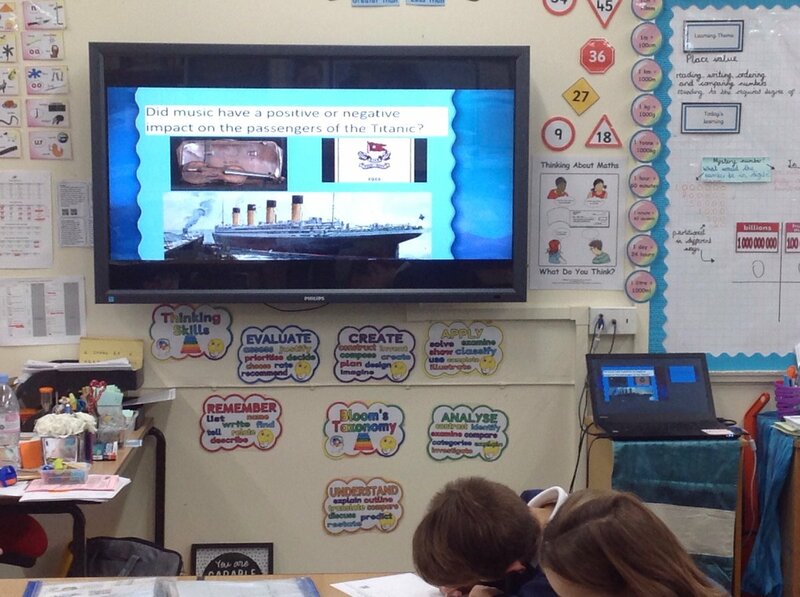 Families join us on board the Titanic for our showcase afternoon! Captain Edward John Smith and his crew welcomed passengers on board the Titanic this afternoon. They sampled our third class menu, were entertained by Irish jig dancing and heard who was to blame for the terrible disaster! I am so proud of all of the Deer Class for their amazing hard work! We have loved sharing our work with our families and we are so grateful for their support this afternoon. What a great end to the term! After a night full of sleep, the children are waking up for breakfast and their final two activities. We will be arriving back at school at the expected time, in time for the end of the school day. Year Six have arrived safely at Caythorpe Court...let the fun begin! We have heard from the staff accompanying this year's PGL trip. They had a good journey and are busy settling in to their holiday. Third Class Passengers Cook up a Storm! After researching the types of foods eaten by passengers on board the Titanic, we decided to have a cooking lesson and recreate one of the dishes. We imagined we were third class passengers and created our own vegetable soup! We learnt many new skills including peeling, chopping and dicing vegetables, softening onions and adding stock. It smelt beautiful when it was cooking, so much so that Mr Hawkins, Mr Shortland and Mrs Paul were drawn to our classroom to come and see what we had been making! We cannot wait to try our dish! How did music affect the passengers on board the Titanic? We listened to three different pieces of music and wrote down how they made us feel or we drew pictures of what the pieces made us think. We decided that some music might have made the passengers feel relaxed and calm, especially the song that was reportedly played in the final moments. However, we believe that this music lured the passengers into a false sense of security and made them think that all was fine on board the ship when in fact the ship was sinking! We made some excellent observations and mature responses.